Manufacturer of a wide range of products which include epoxy adhesive. 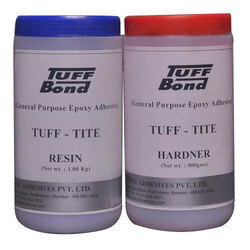 TUFF-BOND - Tuff Tite A( RESIN ) and Tuff-Tite B (HARDNER) is a versatile two component adhesive system for high Bond strength applications. · Cured mass tough and elastic with high resistance to impact stress. · Thixotropic flow characteristics, useful for vehicle surface. Looking for Epoxy Adhesive ?